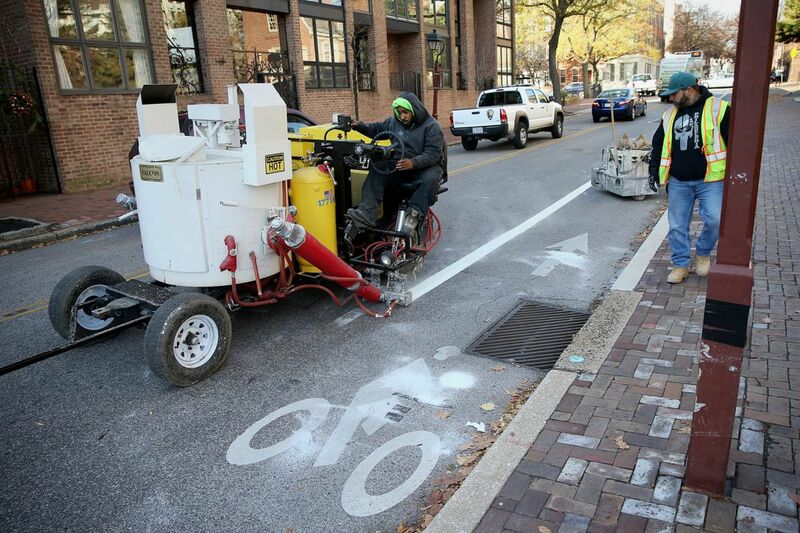 Darryl Carroll, Philadelphia Streets Department line striper crew chief, left, repaints a bicycle lane line on Spruce Street as fellow worker Jose Gonzalez follows his progress on Saturday, Dec. 2, 2017. The restriping, which was previously scheduled, took place days after a bicyclist was killed in a crash at Spruce and 11th streets. On Saturday, in the early morning sun, a crew lay down paint in careful white strips on Spruce Street, providing a clear, unfaded bike lane. The repainting of the lane, from Second to 24th Streets, was something activists had long demanded, along with the repainting of other bike lanes throughout Philadelphia. Whether it would have saved the life of Emily C. Fredricks, 24, who was killed four days earlier at 11th and Spruce Streets while cycling in the bike lane, is impossible to know. Westbound on one-way Spruce, Fredricks was hit by a private trash truck as it turned right onto 11th Street shortly before 7:30 a.m.
City officials said the timing of Saturday's bike-lane repainting was not in response to Fredricks' death and had previously been planned to take place in December. "It's long overdue," said Sarah Clark Stuart, executive director of the Bicycle Coalition of Greater Philadelphia, who biked to Spruce Street to see the painting for herself. "It should have occurred last spring." Fredricks' death has led to calls for safer bike lanes. On Wednesday, protesters created a human bike lane along Spruce Street. Also since the accident, someone used white spray paint to fill in gaps in the faded bike lane. That work was covered up Saturday by the Streets Department workers. At least 26 cyclists have been killed in Philadelphia since 2010. Fredricks was on her way to work at Le Chéri near Rittenhouse Square, where she was an executive pastry chef. Services for the East Brunswick native are set for Monday in Old Bridge, N.J. While the Saturday painting replaced a faded and, in some spots, invisible line with a bright white one, activists say that's not enough. The painting provided clear, solid white stripes, replacing faded and, in some stretches, missing sections of bike lane on Spruce Street. "It's too late to have made a difference for Emily Fredricks," Clark Stuart said. "It's got to be just the beginning of more enforcement and more protection." She and others advocate physical dividers to separate bikers from cars. She said officials should focus on "finding a solution as soon as possible that can provide the maximum protection" for cyclists. On Friday, Randy LoBasso of the Bicycle Coalition said: "The City of Philadelphia released a Vision Zero Action Plan earlier this year — which is good — but we are all still at the mercy of district City Council people, who feel they have the right to dictate where and how safety improvements are constructed; and small, elite groups of people in neighborhood organizations, who have been able to block the protection that's sorely needed all over the city, including on Spruce and Pine Streets. The fate of thousands of Philadelphians should not be decided by the emotions of a few." Near the intersection of Second and Spruce Streets on Saturday morning, Greg Flanagan and his 10-year-old daughter, Audrey, both wearing helmets, were riding skateboards. Their family of four often bikes together, Flanagan said, and his wife cycles down Spruce Street almost every day to get to work. "I'm glad they're repainting them," he said, adding that he would like to see the city study protected lanes. His daughter agreed. "I think there should be some sort of protection there separating the street from the bike lanes so people don't get hit by trash trucks," Audrey said before scooting off with her neon skateboard. The city hoped to complete the Spruce Street painting to 24th Street on Saturday, spokesman Mike Dunn said.